, Google SketchUp & Building Maker, and Panoramio, these users are adding geographic information for millions of users to explore in Google Maps and Google Earth. 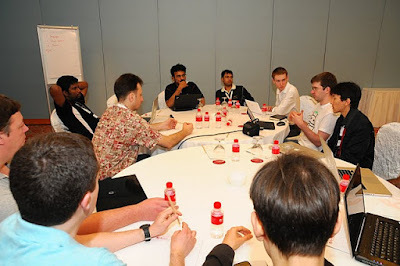 Recently some of the most active Map Maker mappers, 3D modelers and Panoramio photo contributors from around the region gathered in Singapore to attend the first ever Asia Pacific regional Geo Community Summit. Map Maker Software Engineer Robin Anil answers questions during a Q & A session. 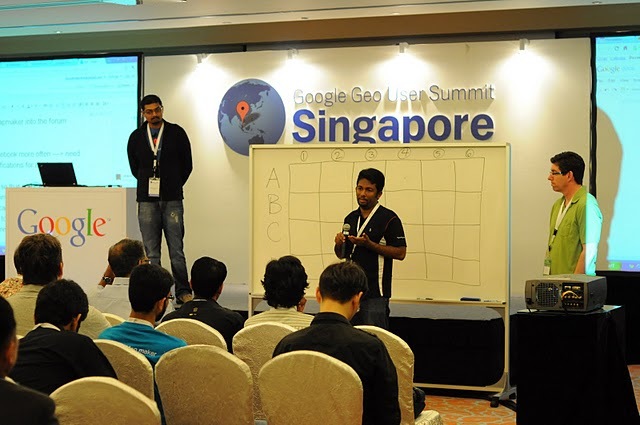 The summit celebrated top mappers, modelers and photo contributors by asking individuals to tell their stories, brainstorm potential new product features directly with Google engineers during the unconference sessions, as well as make plans for events in the forthcoming year. We learned that India mapper CNR wakes up at 4:30am every morning to map. Pakistan mappers Faraz, Jabran and Omer worked together over the course of two years to map the roads of their country. They even turned Google Calendar into a way to track who was mapping what, and when! Thanks to the efforts of Map Maker contributors throughout the Asia Pacific region, more than a quarter of a billion people now have detailed online maps of the places they live. To learn more about this recent summit, you check out photos and videos or see detailed session notes and presentations on the event website page. If you’re interested in attending future events, please see the Map Maker Events Calendar, 3D Events Calendar, and Panoramio Events Calendar for upcoming activities. We look forward to celebrating more great achievements from our community of mappers, modelers, and photo contributors in the region. In countries like India, Pakistan, the Philippines, and Kazakhstan, a community of passionate users is helping to bring geographic content online—in many cases for the first time. Using products like Google Map Maker, Google SketchUp & Building Maker, and Panoramio, these users are adding geographic information for millions of users to explore in Google Maps and Google Earth.